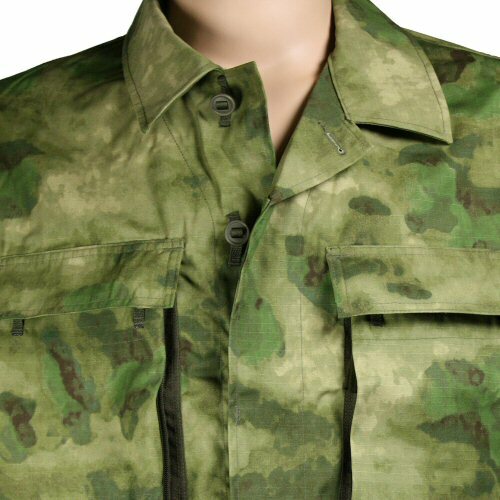 Newly developed to provide a hot weather alternative to the Operator smock, the operator shirt or lightweight tropical jacket is designed with durability and ventilation in mind. Slotted buttons are used on the pocket flaps and down the shirt so they will not fall off accidentally. 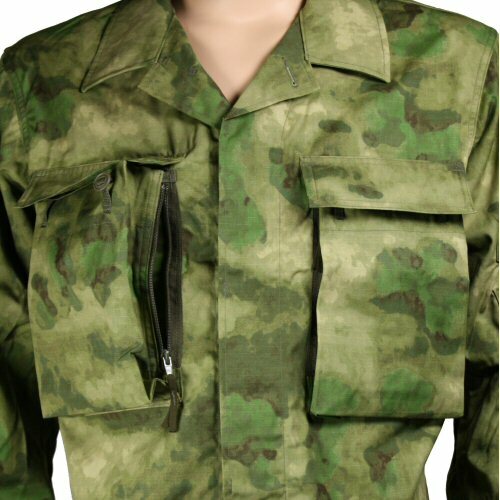 The shirt features two large bulgy pockets on the front which can zip open like chest dump pockets and large arm pockets with a small insignia panel on the arms to reduce the velcro coverage. 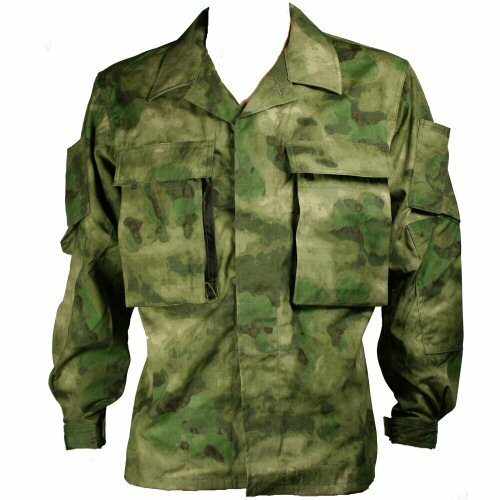 The shirt cuffs close with velcro and have a pleated gusset designed in to prevent dirt and dust from entering the wrist area. No central zip which will prevent air from reaching the body. The underarms are not sewn together, but are left open and an extra panel of mesh material is sewn in place. This automatically ventilates under the arms and near the upper back and chest areas with movement. The shirt or lightweight jacket has no waist pockets, so it can be worn tucked into trousers or openly. Elbows are reinforced with a double layer of material. 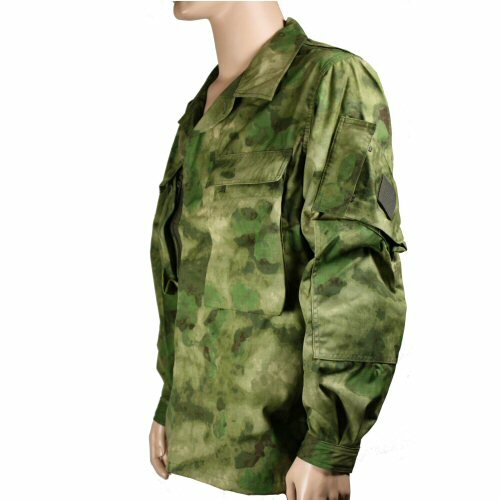 Made from genuine DCS ATACS FG ripstop, 50/50 NYCO, vat dyed for colour fastness. Sizes M (38-40in), L (41-43in), XL (44-46). Detail of collar and slotted button front. 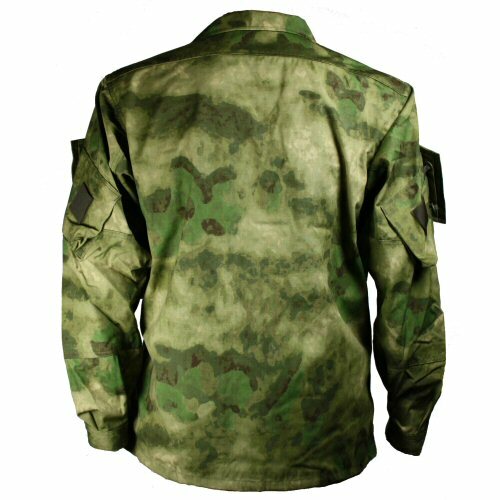 The left side of the shirt showing the elbow reinforcement and arm pocket with small velcro insignia panel.